A summary of today’s show: Tom Peterson, founder of Catholics Come Home, and Janet Benestad, secretary for faith formation & evangelization, tell Scot about the origins of the Catholics Come Home campaign, where Tom’s inspiration came from, how the acclaimed commercials came about, and the best ways that local Catholics can share their faith with others to invite them back to the Catholic Church. 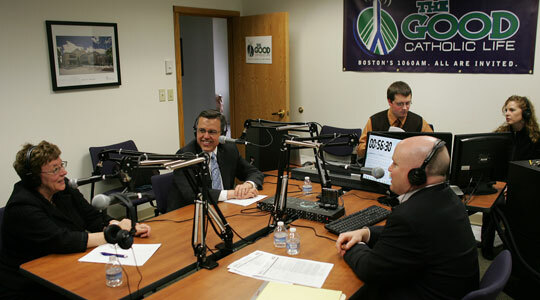 1st segment: This CatholicsComeHome.org initiative is the largest outreach effort of the Archdiocese of Boston in more than a generation. It took 2 years of planning, fundraising and coordination. Many of you have seen the commercials on television and heard them on WQOM. They are outstanding presentations of our faith. Hopefully you also saw the front page story in yesterday’s Boston Herald, which featured an interview with Cardinal Sean and several Catholics that have returned home to the Catholic Faith. Catholics Come Home features several commercials. The most frequent one you’ll see on TV is called EPIC. Let’s listen to that now. 2nd segment: Scot welcomes Tom Peterson and Janet Benestad to The Good Catholic Life. We just listened to the “Epic” commercial from CatholicsComeHome.org. Scot said he can say that he’s never heard a more powerful 300-word description of the Catholic Church. It still gives him chills when he hears it and watches the commercial on TV. There are so many powerful lines. Scot asked Tom to talk about the development of that commercial and some of the scenes. He said it was a byproduct of a retreat experience he had on a Marian men’s retreat where he asked God how to serve him. Tom felt God calling him to use his advertising talents to spread the Good News. The first diocese he worked with was Phoenix. Epic puts the 2,000-year history and accomplishments of the Catholic Church in a an easy-to-grasp and attractive format. Our Catholic story isn’t being told properly by the secular media and it’s about time that we take the Good News and bring it to the ends of the earth in a positive, enriching and beautiful way. Scot asked how challenging it was to boil the 2 millennia of history down to 120-seconds and then 30-seconds? Tom said that with God all things are possible. He said there were many attempts that ended up in the wastebasket, but these successful ones are inspired by the Holy Spirit. He had a lot of good people who contributed to the development. A lot of it is based on the book “How the Catholic Church Built Western Civilization” and to boil it down wasn’t easy,. but it hits on the high points of the major accomplishments and most beautiful things about our Catholic faith. When you hear the commercial, it’s great, but when you see it, there’s something special that happens in the soul. Scot asked how many locations it was shot in. Tom said it was shot all around the world. Rome was the central point, with the Holy Father and [St. Paul-outside-the-walls]; other locations around the United States as well. Some locations were real with people indigenous to that area and others were created or re-created to help save costs, such as the Tongan baptism or the Mexican fiesta or the African Mass. Brought together the wide diversity of the Church. They did lots of focus group testing to ensure that people liked the ads and that Protestants wouldn’t be offended by the message, that former Catholics would feel invited, that current Catholics would feel proud, and people of no faith would feel invited. They heard over and over that it was authentic, that the images were beautiful, that they taught people things they didn’t know before, such as that Jesus founded the Church and that the Church through the inspiration of the Holy Spirit brought forth the Bible. Scot said he loves the scene from Rio de Janeiro of the statue of Christ the Redeemer as well as the unbroken succession of Popes. What are Tom’s favorite scenes? He loves the scene of the aid worker wearing a crucifix working in the Vietnamese jungles, helping a young child. Also when the Holy Father is smiling and waving at the crowds. The Blessed Mother, to show she is the mother of our Church, the picture in St. Peter’s Square. There are many stories related to the filming as well, things that happened that shouldn’t have happened. For instance, they were able to get permission to film with a 40-foot robotic crane in St. Peter’s Square, even as an unknown production at the time. Now Catholics Come Home is so well-known in the Church, but at the time to be laypeople apart from the hierarchy of the Church trying to put together TV commercials advertising the Catholic faith, must have seemed crazy to some. Tom said it is his God-given gift of tenacity and he never doubts God. He always seems to come through. God chooses the unlikeliest people to accomplish so much. Many people in important positions came to believe in what they were doing. The words of the commercials are very moving as well. Scot asked Janet what her favorites are. His is “For centuries, we have prayed for you and our world, every hour of every day, whenever we celebrate the mass. ” Janet’s favorite is “We are Catholic. Welcome home.” Every day here in the Pastoral Center and in our parishes we pray for those who strayed from the Church so that people who are away from the Church can find their way back. Scot said it is amazing to consider that the Church prays for the world every minute of every day for two millennia. Tom said the words come from a lot of uncredited heroes who have given him little nuggets of inspiration over the years he’s been developing the commercials. Tom and his team at CatholicsComeHome.org customized the “Epic” commercial with some Boston scenes for our campaign here. Janet said there was a scene of real Portuguese fishermen on the Boston Fish Pier. They saw the priest walking by and asked him for a blessing and that’s the scene in the commercials. Another favorite is the scene recorded in front of St. Bernard Parish. The director of Catholics Come Home in Boston, David Thorp, died very suddenly in January and he happened upon the idea of showing the priest sharing a donut and coffee with a homeless person in front of the church and David stood in as the homeless person. Scot said David’s best description of the work of evangelization came from Henri Nouwen: “Evangelization is one beggar leading another beggar to the bread.” David did not come across as an expert, but just as someone sharing the faith in his heart. There’s also a scene in front of Fenway Park with a sister and children. Localizing the commercials brings the experience of the faith home to Bostonians. The fourth local scene is the Charles River with Harvard in the background. There are many students in Boston and Catholic students have been taking Catholics come home to heart. Also, we see the Basilica of Our Lady of Perpetual Help, Mission Church, in Roxbury. Scot asked Tom how the commercials also restores the morale of Catholics who are still in the pews, but who have been hanging their heads after the events of the past decade. Tom said he hears over and over again that it makes them proud to be Catholic and they want to be more involved in the Church. In the season of Lent, during the Mass, as the priest raises the chalice, recall the names of those who have strayed from the Church and give them over to the Precious Blood of Jesus. Scot said that when people see the commercials they get excited about it and they want to share it with others. That’s why the commercials are online at CatholicsComeHome.org and CatholicsComeHomeBoston.org. Tom said their website has three sections: for practicing Catholics, for lapsed Catholics, and for non-Catholics with resources for each of those groups of people. He remembers priests telling him that their confessionals were full after the commercials aired in their dioceses, some people who were away for as many as 30 years. The second most-frequently aired commercial from CatholicsComeHome.org is called Movie, which is a story of conversion. Let’s listen to the Movie spot now. 3rd segment: – Scot noted that this “Movie” spot is quite different from the “Epic” spot. It seems like it is intended to reach a different audience than Epic. No matter what you’ve done in your life, there is good news because Jesus came not to condemn the world, but to save it. His favorite line, the best line of invitation he’s heard in the Catholic Church: “If you’ve been waiting for a sign, this is your chance to begin an adventure with God that will last forever.” Tom said we serve a God of do-overs. But we do have to accept His mercy. We have know we can be forgiven. It’s an upbeat commercial, but it could have been very somber and a real downer. The setting is like Purgatory where people are reviewing their life, which is right out of the Book of Revelations. But halfway through the commercials is all kinds of Divine Mercy theology. The Sisters of the Reparation gave an Advent mission at Tom’s parish and spoke at his parish of Divine Mercy. The next day they were supposed to complete the commercial and he changed the second half of the script. It reminds us that it is Jesus’ mercy that saves us all. Scot said the Movie spot is visually different. It opens with scenes of sin, but halfway through it turns. At first it was a much different emotional experience from Epic. Tom said Movie has a different audience than Epic. Epic is for people who were once practicing Catholic and it connects with their memories of the faith. Movie is for non-Catholics who say a personal relationship with Jesus is paramount, which we agree with especially through Communion in the Mass. It’s also for agnostics or atheists, telling them that there is a God who loves them and wants to have a relationship with. He wrote the line: “If you’re looking for a sign, this is it” for them because we have a generation that is looking for signs. Janet said this commercial is about conversion, which is timely during Lent. We all have faults and failings, and Movie evokes a sense of responsibility and the great solace that it is all put right through Christ. For the Movie ad, they had a group of actors and actresses. There was a scene of a wife cowering as her husband belittled her and then later another scene of them celebrating an anniversary. This mirrors our own lives of high points and low points. The actress who played the wife called Tom later to admit that she had been a lapsed Catholic, but the experience brought her back to the Church. So many people have come back to confession in other dioceses, one of the primary ways people can help those coming back is through The Light Is On For You, helping people reengage through sacramental confession that brings them the redemptive work of Christ. Priests like to tell people that they will not be shocked or upset at any sins they hear, but that they are thrilled to see people lifted of the spiritual weight and burden. The people hear the audible voice that tells them that they are forgiven. In our human nature, we need to hear that out loud. Tom said not only inactive Catholics are coming back, there are also many Catholics who go to Mass every week who are coming back to confession. 4th segment: Catholics Come Home is a lay apostolate, created by lay people. That is significant. Tom said Pope John Paul encouraged people in a document called Christifideles Laici to go out into our workplaces and neighborhoods to bring Christ to others where bishops and priests don’t go. We’re supposed to go out and spread the Good News of Jesus. As laypeople we can say, “I know how you feel. This is how I came back.” Others in our communities know we can relate to them. The secular media also sees this as not just the bishops trying to fill their pews, but is the work of all Catholics. They started in Phoenix in 2008 and have gone coast to coast. More than 200,000 people in the first dozen dioceses came back to the practice of the faith. The largest increase in Mass attendance has been 18% and the average is 10%. By the end of this Lent, they will have reached 40 million people. In Boston, the commercials will air 2,500 times. But Jesus would do this for one person. It’s not about the numbers. Janet said that participating in the ministry of welcoming can do as much for the people welcoming others home as it does for those who do come home. People say it’s strengthening their faith. It’s an opportunity to open a conversation to talk about why we go to Church. The culture tells us that faith is a private matter and should remain private, which discourages people from sharing their faith. Tom said a pastor told him to pray every day and ask Him to lead us to a person every day that he can share his faith with. It’s not walking up to strangers. It’s about being open to the conversation when the natural opportunity comes up. Sharing the joy and peace that comes from being part of the Church and worshipping Christ as part of the Catholic community. For a person who just has a hard time getting the right words, Janet said we can just invite someone to come to a talk or program or social occasion at the parish or to come to Mass on Sunday. People are less apt to say No because they’re responding to your personal invitation. Scot said people in this archdiocese should take responsibility for asking just one person to come to Mass and then to pray that this person will be receptive to the Holy Spirit. Tom suggested inviting someone to breakfast and going to Mass first. Put a bumper sticker on your card or give someone a Catholics Come Home business card that is available. Be willing to respond to someone who asks on Monday morning, “How was your weekend?” to say, “I went to Mass with my family and it was great.” Janet said we are walking advertisements for our Church.